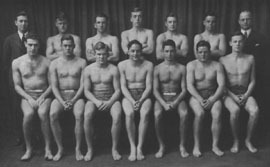 Dartmouth has had a strong water polo program for generations. National Champions in 1997, the men’s team advanced to this year’s Final Four at National Championships. At Ivy Coach, we always appreciate a good underdog story. This past weekend, the Dartmouth College men’s water polo team advanced to the Final Four at National Championships in La Jolla, California. Dartmouth, in the mountains of New Hampshire, isn’t exactly situated in the hotbed of water polo. Water polo is, after all, a California sport. But Dartmouth has had a strong water polo program for many years. Bev’s son played for the team throughout his four years at Dartmouth. In 1997, the Dartmouth men’s team claimed the National Title in historic fashion after placing second in the New England division during the regular season. The Dartmouth women’s team advanced to the National Championship game in back to back years during the mid-2000’s, placing 3rd another year. Last year, the Dartmouth men’s team placed sixth at National Championships, falling to UCLA by a score of 7-5. This year, after dominating Illinois State University in the opening round matchup, Dartmouth faced off against heavily favored Arizona State University. But as Al Michaels so famously once said, “Do you believe in miracles? Yes!” The “impossible dream came true” as Dartmouth, a school of a few thousand, pulled off a monumental 8-7 defeat of ASU, a school of over seventy thousand. In the Final Four, Dartmouth rematched the team that eliminated them from title contention last year — UCLA. After kicking the game off with a one goal lead, Dartmouth fell behind 10-5 before rallying back and almost pulling even with the Bruins. The final score was 10-8, but there were a couple of questionable offensive calls that went against the Big Green towards the end of the game (offensive fouls are relatively rare). Dartmouth then gave Cal a challenge for 3rd place, before falling to the University of California by a score of 6-4. Isn’t it incredible that little Dartmouth College can not only hang with these teams in the pool, but also beat some of them? We wish to congratulate the Dartmouth Big Green men’s water polo team on a phenomenal postseason run this year. Well done, Dartmouth water polo, we’re very proud of you!